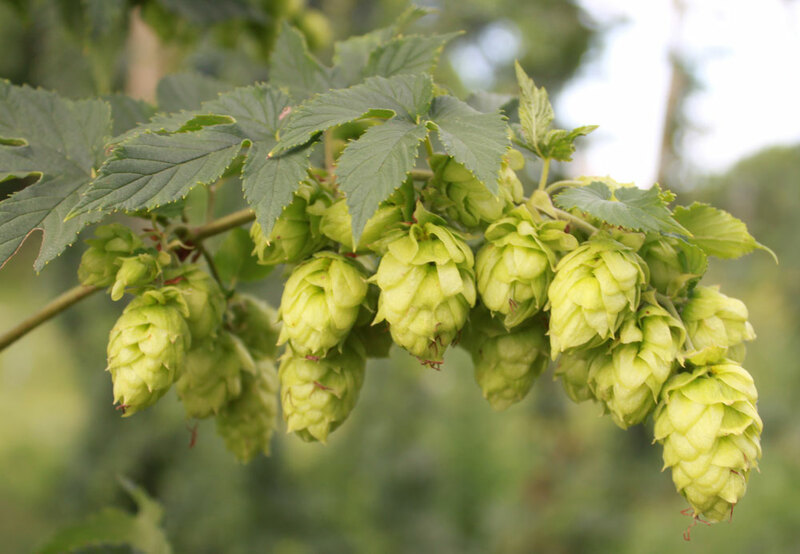 This project is to evaluate eight selected hop varieties, having desirable qualities for craft beer brewers and hobbyists, for plant health, productivity, quality and annual consistency at multiple locations across Nebraska. Funding for the Cultivar trials is from the Nebraska Department of Agriculture and Specialty Crop Block Grant Project. The Nebraska Hops cultivar evaluation had a remarkable season! The working plan for this first year of the three year project was considered to be an establishment year. One in which we prepared the planting beds, installed the trellis and planted the rooted hop liners. Culture was implemented to establish healthy plants, and additionally, observations were made to identify potential pests or cultural challenges we might find. 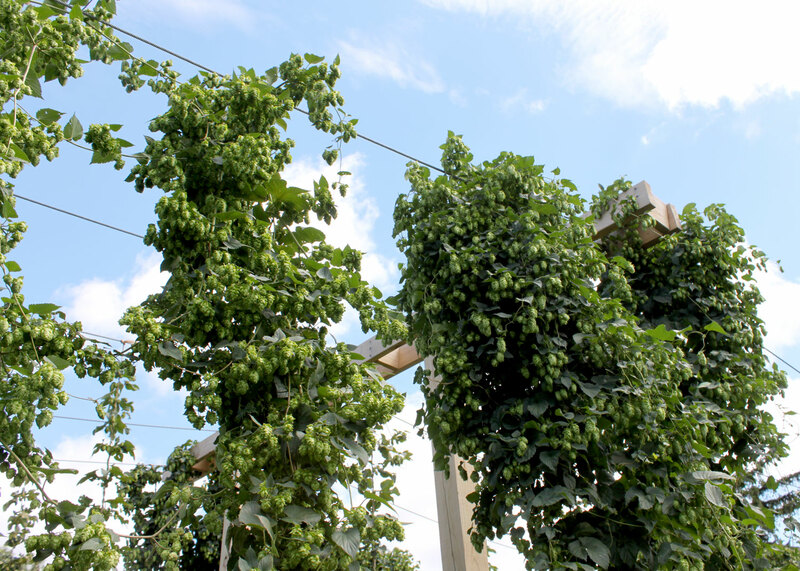 As the season progressed, at most locations, the individual hop cultivars exceeded our expectations in performance. Culture did play a major contributor in the quality we observed, however, we did note that certain cultivars were very consistent in their growth, flowering and cone development. A sampling was made of all varieties grown to investigate the quality of these first year hop cones. The results are shown in the following table. **These varieties not in the statewide cultivar evaluation however a part of the UNL campus collection. A study to investigate the genetic traits of hop plants found in locations (wild or minimally tended) across the State that have exhibited survivability over several decades. Development of regionally adapted hops through traditional plant breeding methods. Hop is a perennial herbaceous crop grown on a trellis system. It grows rapidly and has relatively high nitrogen requirements (150 to 200 lbs/acre). Because hop is a specialty crop, there are few herbicides registered for use, and organic or non-chemical approaches are typically limited to mulching, tillage, and hand-weeding. The combined challenges of providing sufficient crop nitrogen and managing weeds in hops, suggest there may be an opportunity for integrated weed and nutrient management using organic amendments like corn gluten meal and soybean meal. Both corn gluten meal (CGM) and soybean meal are labelled as organic fertilizers, and both have shown allelopathic effects on weed germination and growth at relatively low application rates. However, our recent research in annual vegetable crops suggests that relatively high rates of these organic seed meals (>25 lbs/acre) applied at the surface may inhibit weed seedling emergence via temporary ammonium toxicity without injuring the crop. The objective of this project is to test the potential for an organic seed meal to concurrently displace synthetic nitrogen fertilizer needs and reduce weed seedling emergence in hop production systems. To accomplish this objective, we will leverage an existing experimental commercial hop production facility at the University of Nebraska – a resource of the Nebraska Hops Project – where we will compare corn gluten meal with a weedy and weed-free control. We will collect data on soil nitrogen availability, weed emergence and biomass, and hop yield and quality. The fall of 2017 marked the completion of the second growing season for Stacy Adam’s multi-year study determining if hops are a viable specialty crop for Nebraska. Eight different varieties, Columbia, Centennial, Chinook, Crystal, Perle, Willamette, Cluster, and Zeus (CTZ) are being grown at 5 different sites across the state. Based on the second growing season, popular varieties have performed well and hit important production target. Chinook, Cluster and Crystal performed best in quantity production and in meeting alpha and beta acid targets. The plot furthest west, in Scottsbluff, has been the most promising, where targets on all hop varieties grown have been higher. While weather and pest and disease issues have arisen, the bines have performed resiliently, an important aspect of the study proving hop production is feasible across the state. Keenan Amundsen is behind the hop breeding efforts at the University of Nebraska-Lincoln. He is working with public varieties typically grown in the Pacific Northwest hop production regions and wild genotypes scattered throughout the state to develop locally adapted, disease resistant varieties with superior brewing qualities. During summer of 2016, our researchers were installing five research plantings in various locations statewide. This first year will be site development and plant establishment. The purpose of this project is to create some foundational information applicable to emerging specialty crop hop growers. Four research plantings are "mirror" plantings using same varieties, trellising, and cultural programming. Of specific interest are performance characteristics in varying environmental and geographical situations. On University of Nebraska–Lincoln East Campus, a larger planting will be installed to support efforts in breeding work and chemical application evaluation. 2016 will be establishment for all of these sites, however, updates will be provided.